Welcome to the Fit Small Business QuickBooks Online training course! 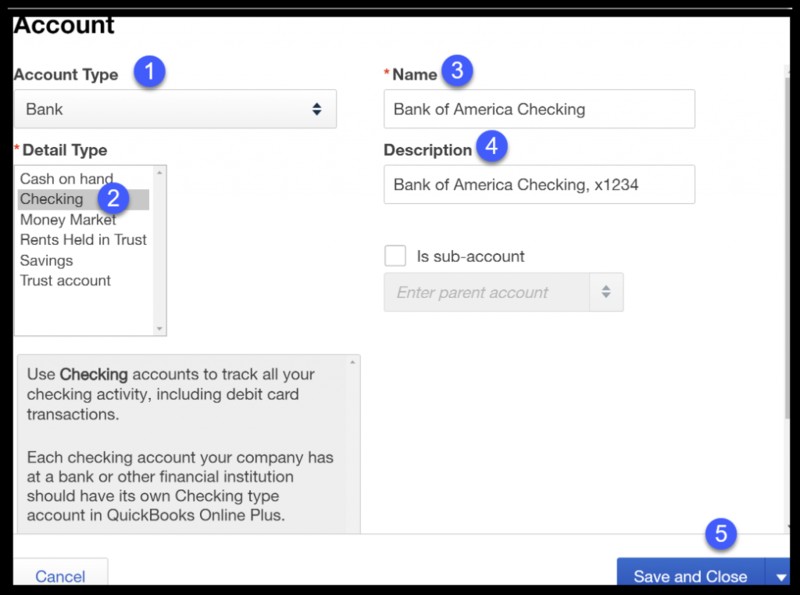 In this lesson, we’re going to cover how to connect your bank accounts to QuickBooks Online. We’ll explain how to automatically link up your bank account to QuickBooks as well as how to import banking transactions manually using a CSV file. If you cannot locate your bank in QuickBooks Online or if you need to download more than 90 days of banking transactions, then you’ll need to import your banking transactions using an Excel format called .CSV or a .QBO file. We’ll cover how to do that later in this lesson. To complete this lesson, you can either watch the video below, read through the step-by-step instructions, or do both. If you’d like to learn more about managing income, expenses and reporting in QuickBooks, download our free, 39-course QuickBooks tutorial here. One of the many benefits of QuickBooks Online is that you can save a lot of time by automatically downloading your banking transactions into QuickBooks instead of manually inputting each transaction. Most big banks allow you to quickly and easily connect to QuickBooks; some of the smaller banks and credit unions do not have that capability. A WORD OF CAUTION: If you don’t have a business bank account and are using a personal bank account, then I recommend setting up a separate bank account for your business as soon as possible. It is always best practice from an accounting and tax standpoint to keep business and personal activities separate. We recommend Chase for a low-cost, full-featured business checking account. New customers can qualify for a $200 sign-up bonus. In order to import transactions into QuickBooks, you will need your online banking user ID and password to log into your bank account. 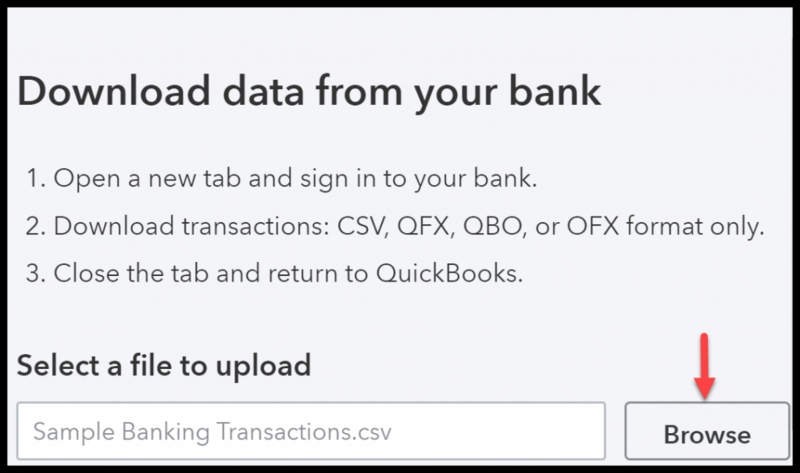 You will only need to enter this information once, and QuickBooks will stay connected to your bank account to download transactions daily. Select from the list of banks right below the search box. If you are unable to locate your bank, then you will need to Import Your Banking Transactions using CSV, format which we will cover later in this lesson. You should see your bank login screen like the one below. Enter the user ID and password that you normally use to access your bank account, as we have done for Paul. Depending on your internet connection and the number of accounts that you have, it may take a few minutes for QuickBooks Online to connect to your bank. You should see a screen similar to the one below that will list all of the accounts you have at this bank. Your financial institution will list all of the accounts that you have with them. Be sure to select only the business accounts that you want to connect to QuickBooks. Select each account you would like to connect to QuickBooks by simply clicking anywhere in the account row. Account Name: From the drop-down, select the QuickBooks account you want to link to this bank account. If you have not set up the bank account in QuickBooks yet, select Add Account from the drop-down. Your screen should display the following account setup window. 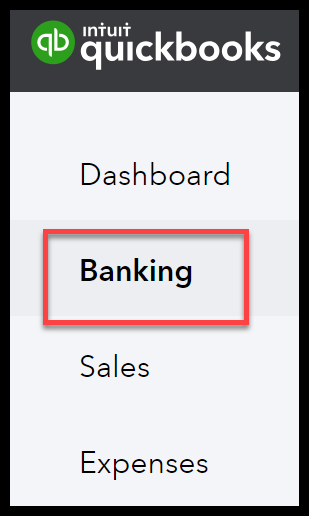 Complete the fields below to set up the bank account in QuickBooks. A. Account Type: Select the type of account for which you want to import transactions into QuickBooks. Typically this would be either a bank or credit card account. B. Detail Type: Here you want to provide more information on the type of bank account. C. Name: This is how the account name will show up in QuickBooks. 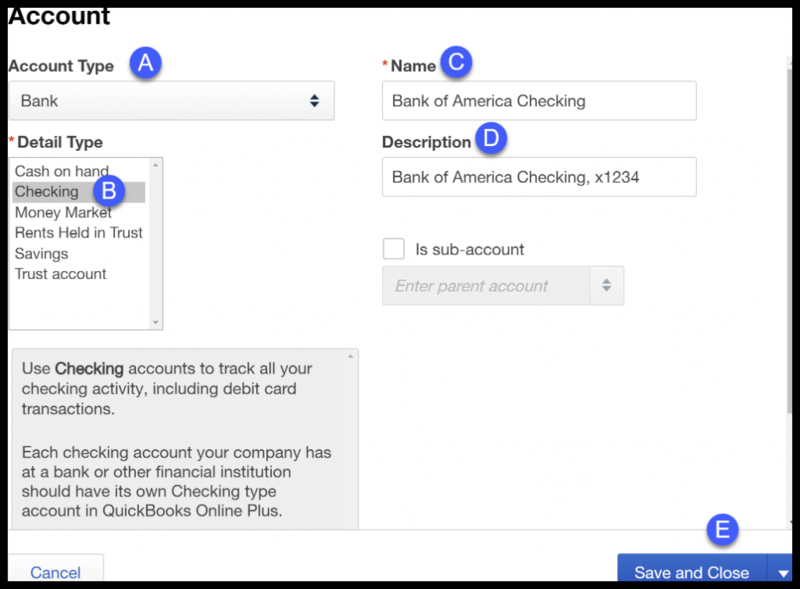 TIP: If you’ve got more than one business checking account that you plan to connect to QuickBooks, then I would be more descriptive here and put the name of the bank and the last four digits of the bank account number (e.g., Bank of America Checking, x1234). 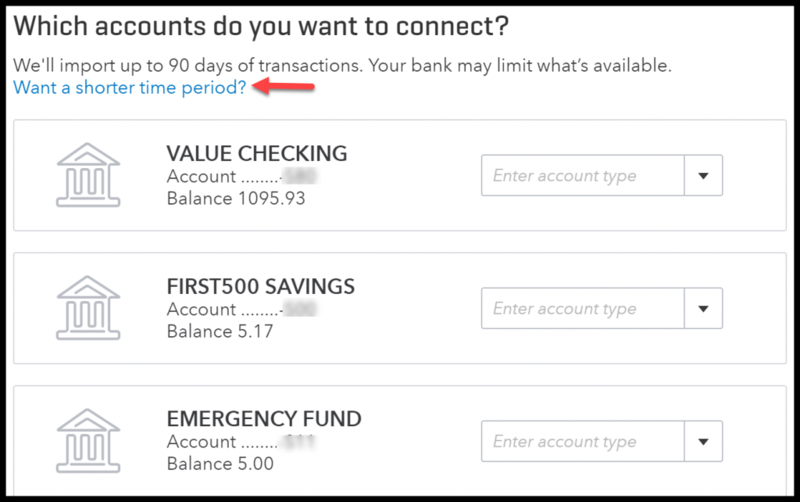 This will allow you to easily tell one bank account from another when you are writing checks. The maximum number of transactions that will download is 90 days. If you need to download more than 90 days of banking transactions, then you will need to Import Transactions into QuickBooks Online Download Using CSV. If the date you start using QuickBooks is less than 90 days, then you would need to use a shorter date range. Example: Paul’s Plumbing has been in business for three years now. Business is good and Paul has decided that he needs to do a much better job of tracking his income and expenses. Paul purchases QuickBooks on January 15. He has decided not to worry about entering any transactions from the previous year into QuickBooks. So his start date will be January 1. With that said, Paul needs to ensure that when he connects his bank account to QuickBooks, his date range starts with January 1. If Paul forgets to select January 1 as his start date, all banking transactions from the last 90 days will download into his QuickBooks Online download file. For Paul, that would include transactions from October, November, and December of the previous year, which he does not want. 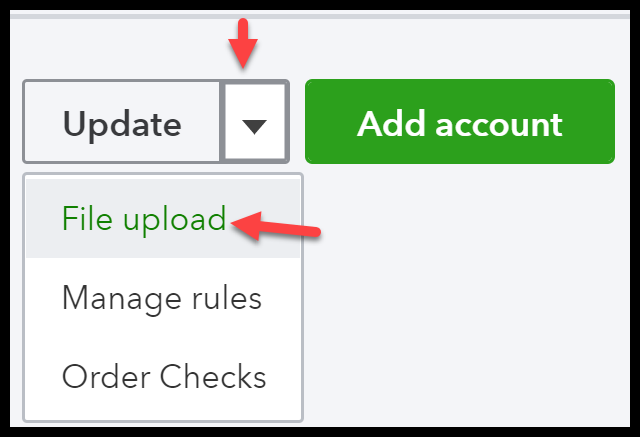 Before you click the connect button, double-check to make sure that you did not select any accounts from which you do not want to import transactions into QuickBooks (e.g., personal bank accounts). A WORD OF CAUTION: Once you click connect, all transactions will be downloaded into QuickBooks. Unfortunately, there is no automatic undo button. Later on, if you find out that you accidentally selected an account that you did not want connected to QuickBooks, then you will need to manually delete all of those transactions before you can delete the account from QuickBooks. Click the Connect button in the far bottom right part of the screen. 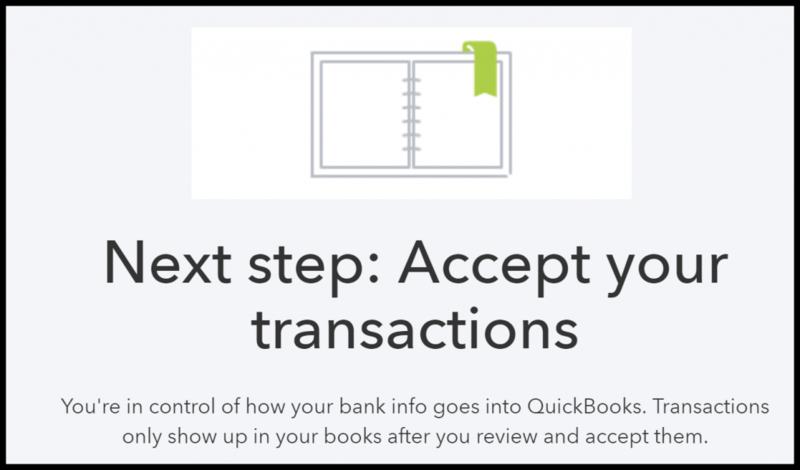 This will start the process of downloading transactions for the accounts you selected in Step 3 into your QuickBooks file. Depending on the number of accounts you have selected and the date range, this could take a while to complete. All transactions that are downloaded will appear in the For Review tab. To learn how to manage banking transactions after they are downloaded, watch our step-by-step video tutorial on How do I manage downloaded banking transactions. To add another account, just click the Add account button as indicated above and go back to Step 1 of this lesson to repeat this process. 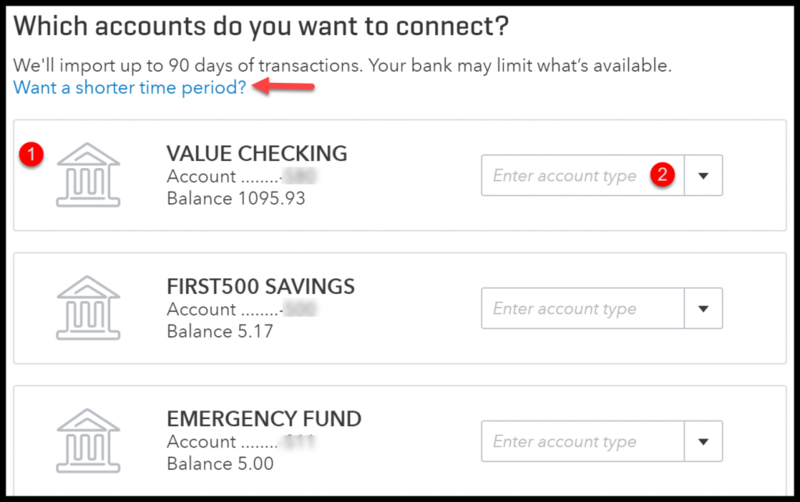 If you have bank accounts at multiple banks that you want to track in QuickBooks, then you will need to go back to Step 1 and repeat this process for each bank where you have business accounts that you want to track in QuickBooks. If you were not able to locate your bank or if you need to download more than 90 days of banking transactions, then it is important for you to understand how to import your banking transactions using an Excel format called .CSV or a .QBO file. To obtain this type of file, log into your bank account and go to the section where you can download transactions or bank statements. 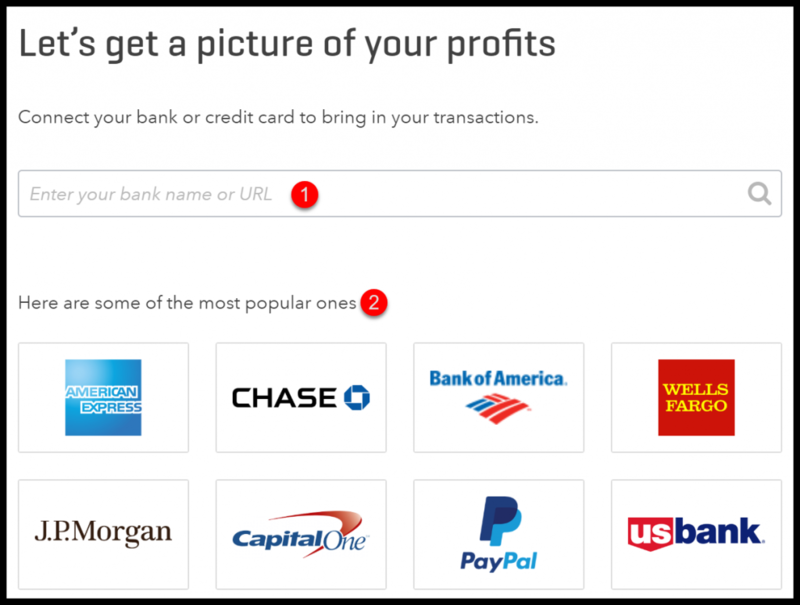 Most likely you will have the option to download your transactions in multiple formats. 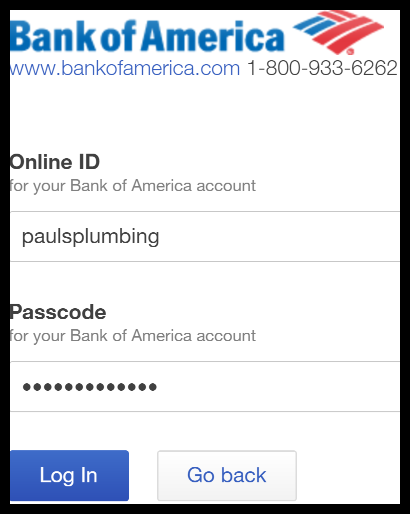 If you don’t see either of these options (.CSV or .QBO), then contact your bank. Let them know that you would like to download your banking transactions into QuickBooks, and they should be able to assist you. From the left icon bar, select Banking. Click the drop-down arrow to the right of the Update button and select File upload as indicated below. Click Browse to locate the file that you wish to upload. From the drop-down, select the QuickBooks account you want to link to this bank account. 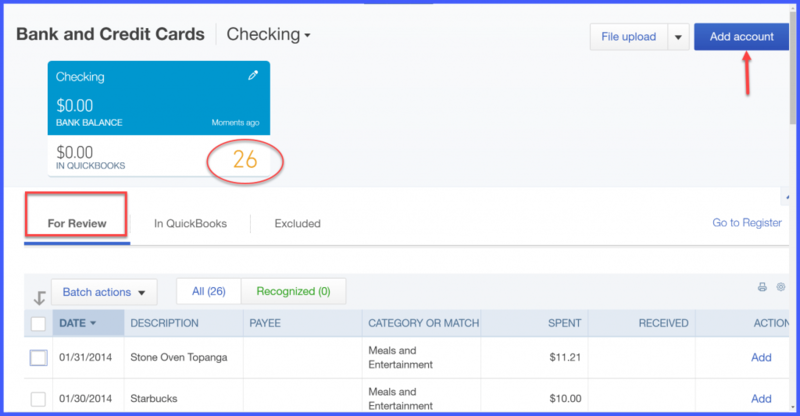 If you have not set up the account in QuickBooks yet, you can do that in Step 5. 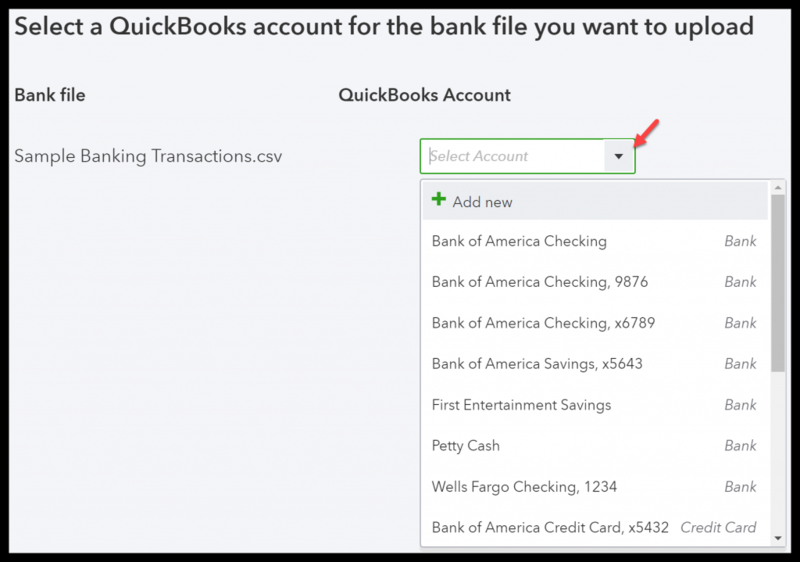 Once you have both the Bank file and the QuickBooks Account selected as indicated below, you can proceed to the next screen. 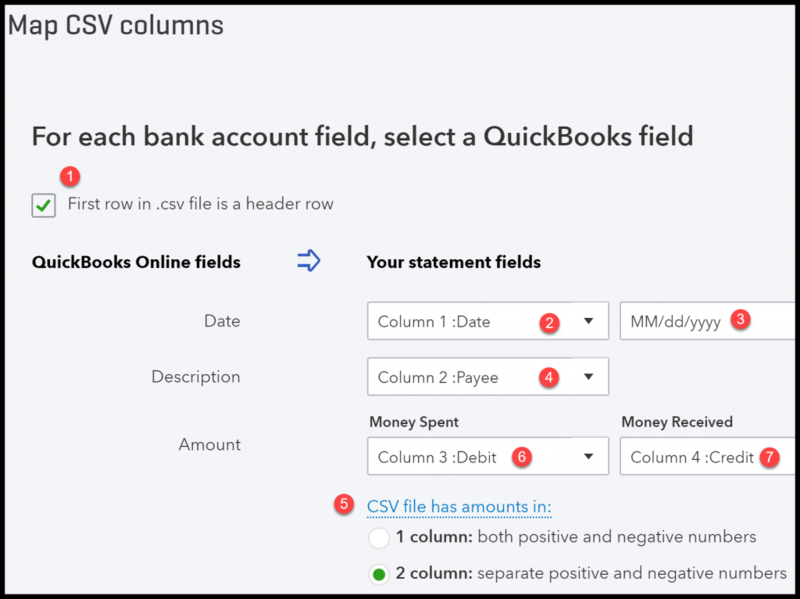 In the screen below, you will tell QuickBooks the columns in your CSV file that match to the three fields (date, description, amount) located in your spreadsheet. This will ensure that the right fields are populated in QuickBooks Online. If your CSV file has a header row, make sure to check the box at the top left of the screen as indicated above. Select the column that has the date in it. Select the format of the date column. Select the column that has the description of the payee (e.g., Staples). Select whether your file has both positive and negative numbers in one column or if it separates the positive and negative numbers into two columns. Select the column that has the withdrawal amounts. Select the column that has the deposit amounts. 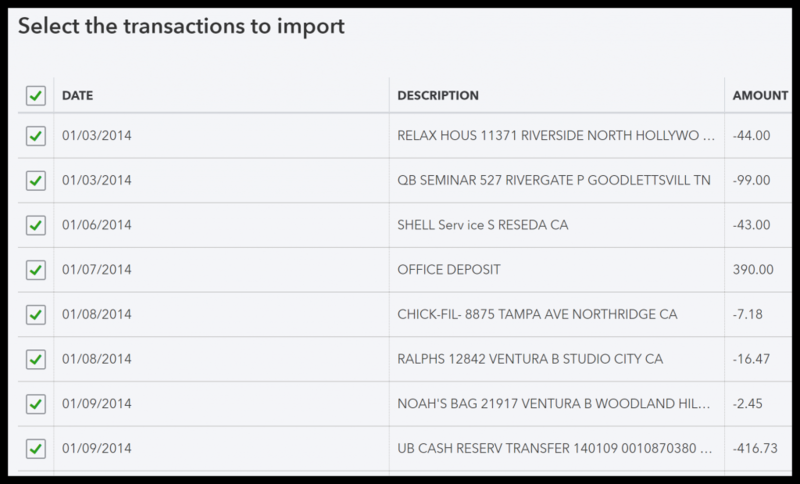 Select the transactions to import into QuickBooks by putting a check mark in the first column and select Next. Removed any formatting, like $, from the dollar amount column. Deleted any blank rows in your spreadsheet. Be sure that everything begins at row 1, column 1 of the spreadsheet. TIP #2: If you make any changes to your spreadsheet, you will need to save it and re-upload it. Go back to Step 3 and browse for the updated spreadsheet. If you agree with the number of transactions, then select Yes. Otherwise, select No to go back and make any necessary changes. All transactions that are downloaded will appear on the For Review tab. To learn how to manage banking transactions after they are downloaded, watch our step-by-step video tutorial on How do I manage downloaded banking transactions. To add another account, just click the blue Add account button as indicated above and go back to Step 1 of this course to repeat this process. That wraps up the section on How to Import Your Banking Transactions into QuickBooks. The next lesson in our QuickBooks Online Training Course will be How to Import Credit Card Transactions. In this lesson, we will walk you through how to import credit card transactions directly from your bank’s website or using an Excel formatted file called CSV. If you’d rather save your time and hire a local bookkeeper to set this up for you, check out our Bookkeeper Directory to find a bookkeeper in your area.